Soursop (scientic name Annona muricat) is a Caribbean fruit that has recently gained popularity due to its natural anti-cancer properties. In fact, it has been found that this fruit originating from South America, Africa and Southeast Asia is 100-fold better at killing cancer than chemotherapy. Soursop is an evergreen, flowering tree also known as guanabana, graviola, and Brazilian paw paw. The fruits of this tree are long, green and spiky. The flesh is white in color and sweet-sour in taste with a distinctive flavor, perhaps like a combination of pineapple and strawberry. It contains essential nutrients including vitamins B, C, iron, calcium, phosphorus, fiber, carbohydrates, amino acids, etc. In addition to the fruits that look somewhat like custard apples, every part of this tropical plant has medicinal properties. 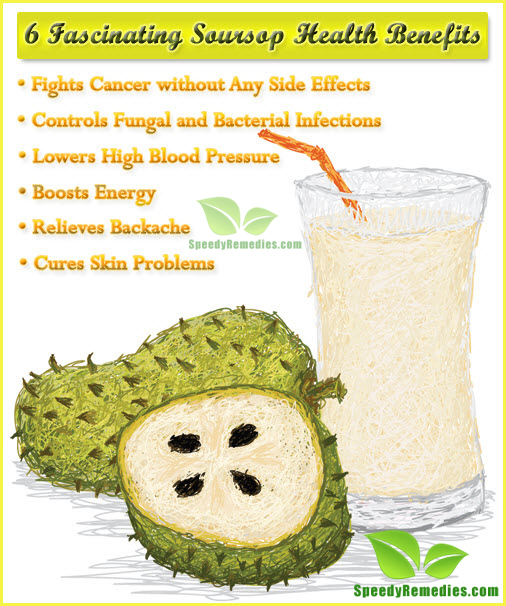 Discussed below are some wonderful health benefits of soursop. As already mentioned, the most impressive health benefit of soursop fruit is that it helps fight cancer even better than chemotherapy and without its nasty side effects. It helps combat cancer cells to stop and inhibit their growth. Research has shown that extracts from soursop tree are effective in targeting and killing malignant cells in 12 types of cancer such as colon cancer, breast cancer, lung cancer, pancreatic cancer, prostate cancer and so on. Moreover, it has compounds that have been proven to be 10,000 times stronger than Adriamycin (a chemotherapeutic drug) in slowing the growth of cancer cells. Unlike chemotherapy, these compounds selectively attack and kill cancer cells only, without harming the healthy cells. Researchers at The National Cancer Institute have also found that the leaves of this plant can effectively attack and destroy cancer cells. On the downside, most of the studies highlighting the anti-cancer effects of this fruit have been in vitro and animal studies; it has not been tested on human subjects so far. 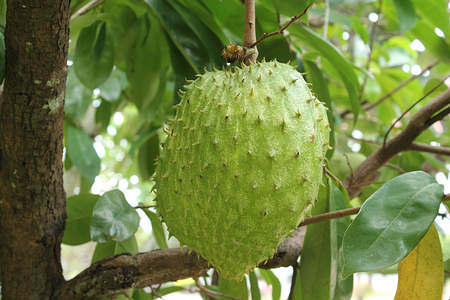 Nevertheless, drug companies are researching more on the compounds that can be derived from soursop to treat cancer. To try this natural treatment, simply include soursop fruits in your diet. Plus, you may prepare a decoction by boiling 10 soursop leaves in three cups of water until the quantity of water reduces to one cup. Drink this decoction twice daily at least for a few weeks. Soursop fruits are high in vitamin C, the nutrient which works as an antioxidant and also protects the immune system. It also has antimicrobial properties that fight fungal and bacterial infections. In a 1998 study published in the Journal of Ethnopharmacology, soursop extract was also found to inhibit the growth of Herpes virus. 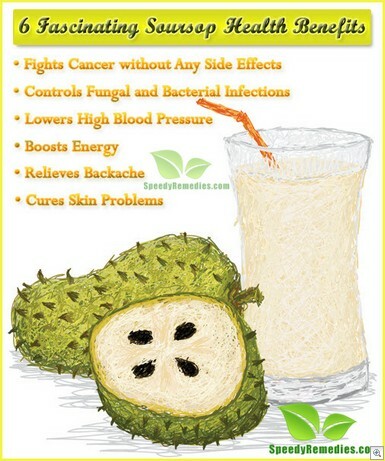 In addition, soursop helps eliminate intestinal worms and parasites. Interestingly, you can prepare a decoction from the leaves of this plant and use it to get rid of head lice as well. Being low in sodium and high in potassium, soursop fruit is good for controlling high blood pressure. Apart from the fruit, an infusion of soursop leaves too helps lower high blood pressure when taken two or three times a day for several weeks. Laboratory tests have shown that this plant may also have potential anti-inflammatory and anti-diabetic properties. The high fructose content in delicious soursop fruits helps boost your energy levels. Apart from eating the fruit, you can also drink soursop fruit juice on a regular basis. People suffering from liver problems urinary tract infection, haematuria, and kidney disease should drink the juice twice daily. If you want to treat constipation though, add more fruits to your diet than juice as they have fiber which provides roughage and aids in digestion. The fruit also has compounds that act like serotonin in the brain and hence helps relieve the symptoms of depression. Furthermore, a decoction prepared from the soursop tree bark works as a sedative and nerve tonic. Drinking soursop tea prepared by steeping the soursop leaves or root in water can help relieve backache. To prepare this tea, boil 20 fresh soursop leaves in five cups of water till the quantity of water reduces to three cups. Then strain the solution and drink three-quarter cup of this tea daily for a few days or weeks, until the pain subsides. Besides, applying a paste of crushed soursop leaves will help reduce arthritic pains. A paste of crushed soursop leaves is excellent for wound healing too as it promotes the healing process. A poultice of soursop leaves can also be used to get rid of eczema, boils, ulcers, and other skin problems. To derive the health benefits of this amazing fruit, you can enjoy it as a fruit snack, add it to fruit cups, salads and smoothies, or have it as a fruit drink. Besides, you can take soursop extracts found in health food stores. But before taking the extracts and supplements, do consult your doctor. As for the fruits and leaves, you can find them at Asian supermarkets. Interestingly, in Indonesia, the immature fruits are also used, often as vegetables. National Center for Biotechnology Information, U.S. National Library of Medicine- Five novel mono-tetrahydrofuran ring acetogenins from the seeds of Annona muricata. National Center for Biotechnology Information, U.S. National Library of Medicine- Selective growth inhibition of human breast cancer cells by graviola fruit extract in vitro and in vivo involving downregulation of EGFR expression.